Our faculty and staff members deliver leading academic education tailored to the unique needs and learning styles of our students – instruction that leads to individual, Christ-centered student growth. This is a school wide effort, coordinated across all subjects and grade-levels. Art education is an integral and important aspect of a Christian education – as God’s creation, we all have been given the gift of creativity. As a result, as we explore and learn through the various methods of art creation (ceramics, drawing, painting, sculpture, mixed-media, etc. ), students will begin to see that the visual arts convey the truth of life and God’s world by exercising their creativity. Further, students will explore and find the areas of the visual arts that resonate with their unique abilities. Finally, through art instruction, students can be taught and will learn to apply discerning Christian minds to their world. Each student will discover, develop, and use their God given talents to create artwork which will display and result in varied artistic responses. Art Education will allow for different forms of expression. Each grade level will learn about many different cultures and their artistic art forms. Each grade level will study selected artists and their given talents and then work to create artwork inspired by and/or using the artist’s stylistic methods. Each student will display and exhibit student artwork during the year. The Bible curriculum provides students with an understanding of the will and work of God as found in the Scriptures. Students explore the drama of covenant history as it moves from Genesis to Revelation. They study the promises of God and the responses of humans. Students are encouraged to ask questions, share insights, and respond to the truths of God’s word. Bible memorization places God’s Word in their memory, and applications extend the lessons into their own lives. The Bible curriculum is designed to foster spiritual growth in the students, equipping them to love God, others and themselves. They study the attributes of God and apply these toward Christian character in their own lives. They learn a biblical view of God’s image in others. They are given opportunities to reflect and respond to God’s grace in their lives. They are encouraged to daily grow in grace and knowledge of the Lord Jesus Christ. What does this tell me about myself? What does this tell me about how I should live? The Bible curriculum fosters spiritual growth both in individuals and in the community. Students are encouraged to share their learning with others, and together worship God for who He is and what He has done. Knowledge of stories and history – God loves his people and God loves me. Understanding how God has worked through His people throughout history. Knowing that we take that knowledge and apply it to our daily lives. Apply that outlook to all areas – it’s an all-encompassing way of teaching and learning. God has created us as people who live in relationship and communicate through language. Ada Christian School trains students in the development and effective use of language so that students learn to express themselves clearly and honestly in serving God and others. Students learn how to listen carefully to the sounds of language, with the goal of understanding how letter sounds combine to make words and sentences. Students also learn to listen for the meanings of the communication, conveyed through content, context, or oral nuances of speech. Students learn to express themselves clearly and honestly, for the benefit of others. Students learn purposeful speech that can relay information, describe, create a story or poetry, or persuade others. Students practice using speech effectively for the communication of ideas and beliefs. Students are encouraged to use speech to glorify God and serve others. Students first learn to recognize words and their meanings in context. Students experience delight in seeing the world through the eyes of the authors; they learn to see with others’ eyes and understand from other points of view. Students study genres of literature to recognize their strengths and purposes, to understand how they have been used in the world, and to discern the value of specific pieces of literature. 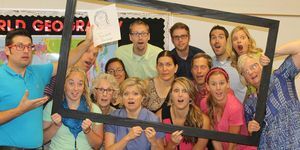 Ada Christian School trains students to ask questions about the author’s intent and product: What view of life is conveyed? Does this acknowledge or suppress God or His work in the world? Students study and practice appropriate grammar conventions so that they can discern and create effective communication. Students learn common words and focus on conventions of spelling, as related to word families and function. Words are chosen from the spelling curriculum and from their other areas of study. Students write to communicate their ideas and beliefs. They learn appropriate grammar and sentence structure, and later learn how to form paragraphs, essays, stories, and research projects. They are given opportunities for journal writing, expository writing, creative writing, and research writing. The mathematics curriculum introduces students to the language of order and patterns, teaching the basic skills of operations and comparison, continually adding complexity as students gain competency. They learn the symbols and terms of the mathematical language, and apply these in their work. Students apply learned skills to a variety of problems, varying strategies to be effective in gaining accurate solutions. They are also given opportunities to explore possible solutions to new problems. Students are trained to reason mathematically, using observation, conjecture, evidence, precision and logic. Mathematics directly intersects with their work in science, and also connects with specific learning in other disciplines. Students are taught to apply mathematical theories and skills to those situations. The mathematics curriculum encourages students to value to role of the language of mathematics and recognize its role in every day life. They learn to respect the work of others in discovering mathematical relationships and applying these to real world problems. They begin to see how God’s gift of mathematics can be used for good or evil in the world, and are encouraged to use mathematics in accurate, honest, and helpful ways in their own lives. Students will gain confidence in math and enjoy the subject area. Students will develop skills in computation. Students will develop awareness of how math is used in the world. Students will develop problem-solving skills for real world scenarios. Students will be able to draw connections from math to their lives. In the Bible we are commanded to sing, play and make music for joy to the Lord and it is our obligation to help students to do this. Everyone can enjoy and be engaged in music no matter what the individual’s ability is… they can enjoy and be a part of the musical world! Each one of us is created in God’s image and we are able to praise him with the abilities and gifts he has given us. Our goal is to further develop and identify these gifts and help students to praise God with their music for their lifetime. Music is a gift from God. It lifts our spirits and expresses our emotions in ways words cannot. It can enhance our worship and prayer life. Music adds dimension to thought and action, and enhances stories. Students learn to appreciate styles of music for the way they reflect the Creator and communicate to others. Music can also enhance the study of culture as music transcends cultural barriers. Music is a significant part of American life. It is part of our history, our traditions and our heritage. Music brings communities together during holidays, during tragic times and in everyday life. It is important to teach our youngsters to understand this sense of community and the impact music has on it. It is imperative that we, as music educators, introduce our children to this important piece of our lives. The students need to create music, listen to it, analyze it, experience it, and understand the impact music has on our world. Students are taught to communicate with music that they produce, both vocally and instrumentally. As their skills increase, they are also given opportunities to share that music with others through a number of performances and worship experiences. The covenant child will praise God through music. The covenant child will develop excellent musical skills that will enable them to participate in music and worship opportunities throughout their lifetime. The covenant child will understand music and its historical relevance in world cultures. The covenant child will be able to create music, and explore their individual musical abilities, loving to participate in music as a member of the kingdom of God. Each person was created by God in His image. We hold the responsibility to teach students how to keep their bodies, minds and spirits healthy. The overriding goal of the PE and Health curriculum areas is to equip students with the skills and practice so that they glorify God by remaining healthy and fit. We strive to teach self-confidence, discipline, purposeful group interaction, cooperation, and an appreciation for the skilled and fit human body as it expresses itself in purposeful motion to the glory of God. Providing opportunities to develop fundamental motor skills, team sports, physical fitness, personal-social skills, and wellness concepts in the pursuit of a healthy life styles, and taking on the development of personal skills and blending them into a concept of challenging students to strive towards their best. 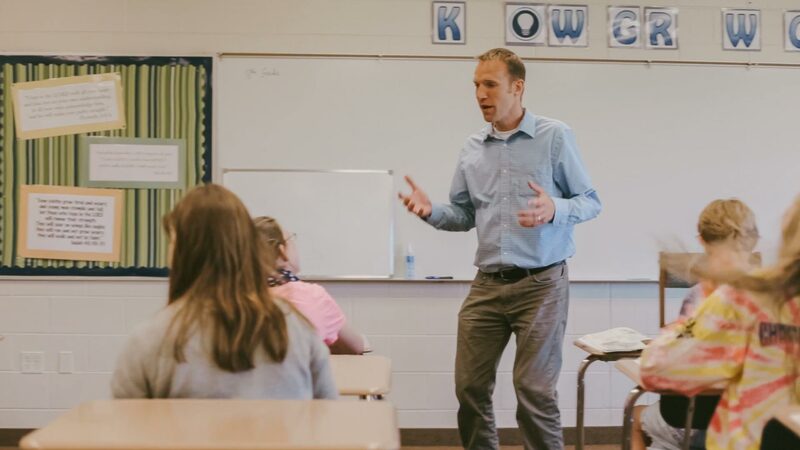 The health curriculum combines the discipline areas of science, physical education and Bible as it teaches students information about their bodies and how their choices about what they eat and how they live will have an impact on their ability to live the life God has given them. The Athletics programs of Ada Christian School enhance the goals of the Physical Education and Health curricula. Students are given many opportunities to participate in team sports, from grades K-8. Although the emphasis is on participation and enjoyment, the goals of good sportsmanship and healthy competition are also realized. To promote fitness and health among students. To move, be active, play games and have FUN! To encourage team work/cooperation & appreciate what our bodies are capable of & the gifts God has given us. To develop the ability to set personal goals and achieve them. The purpose of science education at Ada Christian School is to awaken a sense of joy and wonder as students examine God’s world and their place in it. We strive to simulate intelligent, critical analysis of the surrounding world, and give students opportunities to experiment with and apply scientific concepts. 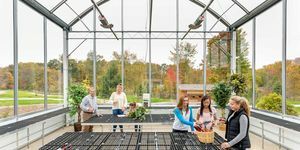 Students are shown how to study Creation from both broad and focused perspectives in the areas of physical, earth and life science. 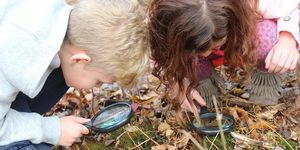 They study both living and non-living things, make observations, design and analyze experiments, modify hypotheses, and connect their learning to existing knowledge in the field. In science classes, students learn to respect Creation and the work of others who have worked in the scientific fields. They learn that their observations become more accurate when paired with those of others. They learn that while one can never fully understand creation, they can continue to learn and ask how new knowledge can better glorify God and serve others. They are encouraged to ask questions about their learning and see how it expands their view of God, the Creator. They are given opportunities to praise God for all that He has revealed in creation. Science education equips students with an understanding of the complex nature of their own bodies, and trains them in appropriate health habits that can last throughout their lives. Students are taught that their bodies, and the bodies of others, belong to the Lord, and must be valued and respected. Science education is integrated with other disciplines, particularly in understanding how the creation is connected with culture, and how it can be used for good or evil. Students are also encouraged to be care-takers of creation and responsible to God for maintaining and developing it. Develop intelligent, critical analysis of God’s creation, through inquiry and experimentation, with real-life applications and connections. Develop respect and awe for Creation and thankfulness for God’s work as Creator, Sustainer and Provider. Develop respect for the work of others in working to understand and care for the world. Develop knowledge of living and non-living things. Develop increased awareness of their role as caretakers and leaders in caring for God’s creation. The social studies curriculum focuses on human relationships and cultures. A Christian perspective emphasizes that each person is unique, created by God with gifts, personality, abilities and ways of functioning. God has placed people in specific times and places and has a purpose for our lives. Students learn to be thankful for how God has made them, and also appreciate the diversity that others bring to the relationships. We are not alone. We live in a culture and are responsible to others. In the social studies curriculum, the students learn about their own culture, as well as cultures in other parts of the world and in different time periods. They study the components of those cultures, and the relationships between economics, climate, belief and value systems, ecosystems and family structures. They are taught to value the contributions of others, in America and around the world. They are given opportunity to focus on Christian contributions throughout history. The social studies curriculum values discernment through the eyes of faith. Students learn to question decisions and actions of the past, learning how these effect the present, and an eye toward preparing for the future. They study how sin distorts people and cultures, and how God’s Word can renew people to live justly, love mercy and walk humbly with God as they live and work in their cultures. The social studies curriculum encourages students to a Christian stewardship of resources. Students are given opportunities to serve others while at Ada Christian School, and encouraged to live lives of service in the future. Students will develop a heart to be good stewards of resources and to serve others in Jesus’ name. God has uniquely gifted us with the ability to acquire language naturally. Just as we have acquired our first language naturally over time, so we can acquire additional languages when exposed to them with meaningful language input. At ACS, the Spanish program begins in 3rd grade and continues through 8th grade. Our school uses a method called Comprehensible Input or Hybrid Immersion to help students with language acquisition naturally and enjoyably. Our program emphasizes listening and reading comprehension in Spanish. 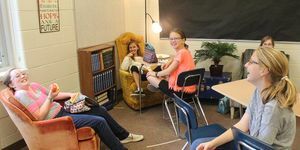 This is promoted in our classes through story telling, song, visuals, gestures, and activities in which students are engaged by making personal and meaningful connections. Starting in 3rd grade, students begin to read and respond in Spanish. Each year our students build on the language they have acquired, creating fluency depth and confidence. To naturally and enjoyably acquire Spanish. To increase awareness of culture and to appreciate diversity. To experience praising and worshiping our God in a new language. We work hard to provide rigorous, age-appropriate curriculum that builds and strengthens the whole child – mind, body, & soul. You entrust us with your children nearly every day. See who teaches their class and learn a bit more about each of these talented individuals we have on staff.